With over 90 million 2+ car home garages in the U.S.A., more and more people are looking create a cool custom space in their home. One of the first decisions in customizing your garage starts with the floor. There are many flooring options on the market, including paints, epoxy, sealers, concrete stains, rubber mats, VCT tile and interlocking modular garage flooring. So, what is a homeowner’s best option? Let’s look at what your garage floor needs to stand up to. The garage environment is very harsh with exposure to chemicals, petroleum products, hot tires, heavy equipment, concrete leaching moisture that causes mold and mildew, and many other factors to consider. There are many options on the market which require extensive concrete prep in order to apply, taking numerous days. In many cases, even with proper floor preparation, these toxic coatings can fail due to a vapor barrier breach beneath your concrete slab, causing moisture to leach up and blister your coatings. Other issues are hot tires staining and peeling up your coatings and the difficulty with trying to patch your floor in failed areas. The first noticeable issue is the odor of rubber in your garage and home. Rubber mats are not the ideal choice for garage floor as you cannot roll heavy objects across them (which causes the floor to buckle) and they trap moisture underneath, creating odor-causing mold and mildew issues. These are the inexpensive peel-and-stick tiles you see at the big box hardware stores. It is very difficult to get these to permanently stick to a garage floor, and thermal expansion can cause them to ‘pop’ out. VCT tiles also do not react well to chemicals or petroleum products, causing them to stain heavily. 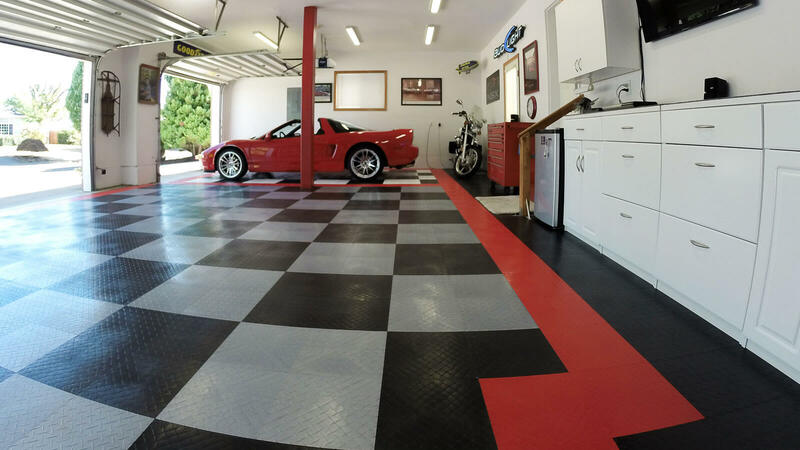 This style of garage flooring was brought to the market in the 90’s by a company called RaceDeck, which today offers numerous patented styles to choose from. RaceDeck interlocking garage floors are a full-suspension modular garage flooring system that installs in just hours. The patented design makes for a tool-free, glue-free, and paint-free installation. Another great feature is RaceDeck’s full-suspension flooring that has a patented channeled understructure to allow air, moisture and liquids to flow freely, eliminating all moisture and mold issues. RaceDeck is proudly Made In The U.S.A., with quality and durability not found anywhere else.